This spacious and comfortable two bedroom apartment feels like home! As you enter the high-rise building with its many floors you already feel at home with entire Cape Town painting in the entrance hall. The principal room, the spacious open plan living area and the master bedroom, both open onto two separate balconies the apartment is on the 8th floor with amazing views. As you open the front door you immediately see the old vintage 1870 Kensington Station clock to remind you of the wonderful time you going to have in the apartment. From there, the majority of the apartment – dinning/living area, kitchen – are all contained in one bright, open space. Between the dining area and the kitchen sits a dividing wall/bar that serves as a casual eating surface , the dining table comfortable seats four( yes, there is silverware to feed six too..) fully equipped kitchen complete with an oven, fridge, dishwasher, toaster and a microwave. In the living room area you find a L-Shape couch which you can enjoy watching the sunset from, Flat screen TV with selected DSTV channels. Main bedroom boasts with ensuite bathroom a comfortable queen size bed with lots of cupboard space, and a separate sliding door which lead to the balcony. Before you make your way to the 2nd bedroom you can peek inside the bathroom and get a glimpse of the shower & bath, Second bedroom with double bed and separate sliding door with own little balcony is a plus point. Towels and bed linen are offered in this self-catering accommodation. Facilities for disable guest, lift, access controlled complex, on-site facilities include a swimming pool and coin operated laundry as well as a personal lock up garage with remote control. Don’t forget the outside patio table & chairs is there for you to relax, unwind and just to look at the colors of which constantly change, from a fiery sunrise to an unforgettable sunset at dust. 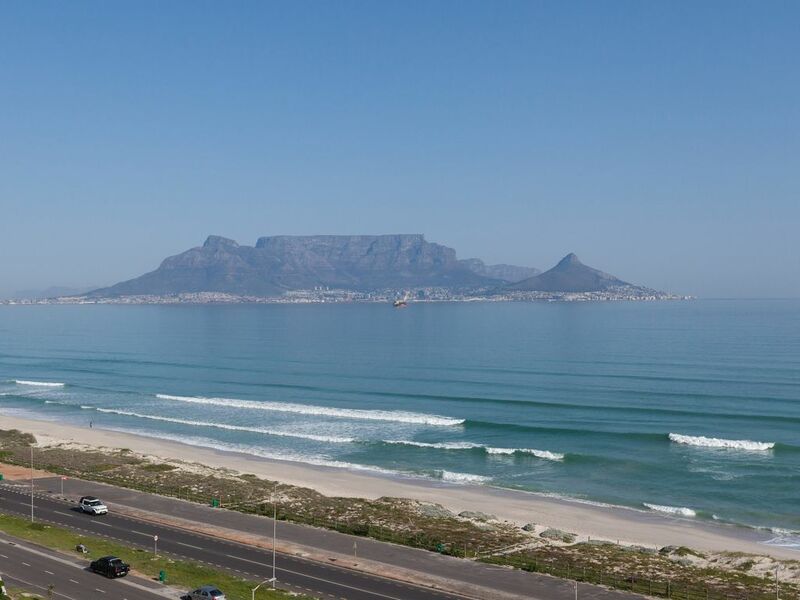 The Bay is situated only metres from Blouberg beach. The beach stretches in both directions, making it great for long walks and exercising. World class Kite-Surfing, Canoeing, jet-skiing, yachting, windsurfing and other sports are all at your doorstep. A good number cater for the many visitors who descend on the area over weekends and during holidays, but in among these are some gems the locals keep to themselves. Catch 22 – Sitting upstairs in Catch 22 on Marine Circle in Blouberg, you feel like you’re right in the hub and bustle of things, exotic cocktails as you watch the sun go down. Blue Peter – Right on the edge of the sea, the lawns of the famous Blue Peter are packed with the young and beautiful on weekend summer afternoons, a menu of hamburgers, pizzas, grills, seafood and light starters. building waterproofing at building complex continue until further notice. PLEASE NOTE that waterproofing is being done on the outside of the building and no work at the building will be done over weekends so only Monday to Friday its scheduled to be completed mid-April. Please note that a ZAR1000 refundable deposit is required per booking and be refunded within 7 working days of your departure. As well as a ZAR250 late arrival fee applies for arrivals from 18:00 onwards.